The premiers of New Brunswick and Nova Scotia and the Governors of Massachusetts, Maine, and New Hampshire—the five provinces and states bordering the Gulf of Maine— established the Gulf of Maine Council on the Marine Environment in 1989 to maintain and enhance environmental quality in the Gulf of Maine and to allow for sustainable resource use by existing and future generations. 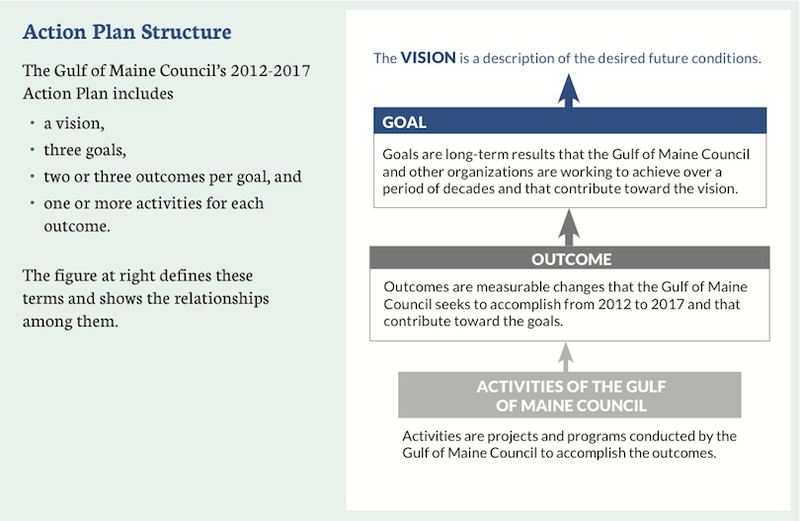 The Gulf of Maine Council on the Marine Environment Action Plan 2012–2017 presents the goals, outcomes, and activities that the Council will pursue in this five-year period. Many activities will be implemented in collaboration with partner organizations. The Action Plan addresses issues that require or benefit significantly from regional collaboration and have been identified as priorities by Council members representing federal, state, and provincial governments, nongovernment organizations, and business interests. A vision statement guides the Council’s efforts. Through the 2012–2017 Action Plan, the Council is pursuing three long-range goals that contribute to the vision. The Gulf of Maine plays a major role in the region’s economy. The Gulf’s economic value depends on a healthy ecosystem. Council defined one or more activities, which are projects or programs that contribute to the outcome. Work plans for implementing the activities are posted on the Council’s website at www.gulfofmaine.org/workplans. The Council developed this Action Plan with input from partner organizations and the public. It reflects recommendations of relevant studies, reports, and workshops. It is shaped by the Council’s twenty years of experience and addresses leading policy and regional priorities. 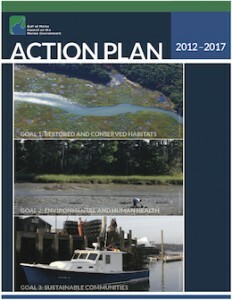 The Council anticipates that funding to implement the activities in this Action Plan will be provided by the Council (and its member Canadian and United States agencies); by nongovernment partners whose missions align with the activities and that may already be working on these activities; and through successful funding proposals to public agencies and philanthropic sources.